The old cinder-block building on the Benton County Fairgrounds has held a variety of events over the years from holiday bazaars to library book sales, but on a warm, sunny day in November, the floor was covered with an unusual display: row after row of folding tables holding dozens of blanket-covered crates. Out in the parking lot, pulled up close to the front entry, was a big, white trailer with an enormous graphic of a cat on its side. Shuttling between the trailer and the building, a steady stream of veterinary and pre-veterinary students held unconscious cats bundled into blankets. The Feral Cat Coalition of Oregon (FCCO) had come to town. The FCCO uses a trap-neuter-return strategy to combat the exploding growth of feral cats in Oregon. The coalition supplies humane traps to property owners who bring captured cats into a clinic for sterilizing. It is the only proven way of reducing the feral cat population and it depends on the kindness of many volunteers including the veterinarians who perform the surgeries. 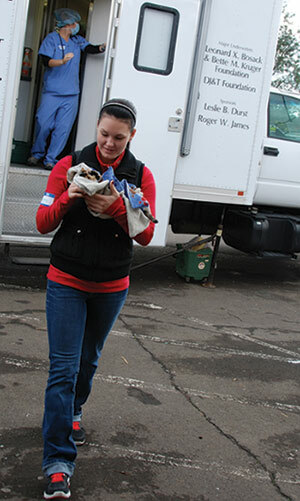 At the fall clinic in Corvallis, six different veterinarians worked in the operating room of the big white trailer performing nearly 100 sterilization surgeries in just half a day. OSU students from the College of Veterinary Medicine (CVM) prepped the cats for surgery, moved them to the recovery area, and monitored their progress. The cats were returned to property owners for release the next day. Posted in OSU College of Veterinary Medicine. © 2019 Animal Connection, all rights reserved.